Several tennis facilities are available in the North Coast region, including the fine tennis club at Sea Horse Ranch, a private gated community between Cabarete and Sosua. Open to the public, the 5 clay courts are groomed twice a day and two of these are lit for evening play. The resident pro, his assistants, and numerous ball boys will assure that visitors have the total tennis experience. Private and group lessons are available for adults or for a small charge, one may hire a skilled assistant pro to provide a workout geared to your level. 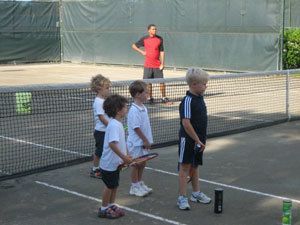 The tennis academy currently has 20 children of various ages and skill levels participating in their popular programs. A pro shop and refreshment kiosk caters to players from all over the world in a friendly, informal atmosphere. There are a number of stable facilities in the North Coast region, including the world-class Equestrian Center at Sea Horse Ranch. This unique facility, offering 25 stalls and several indoor and outdoor rings, provides instruction in basic riding techniques, both western and English. One may arrange private or group instruction at all levels in dressage, jumping, and several western disciplines as well as instruction in the art of the Paso Fino, the favored horse of the Dominican Republic. Trail rides are also given, utilizing over 7 miles of bridle paths and beaches, at affordable rates. The stable boards a wonderful variety of horses including Paso Finos, quarter horses, and thoroughbreds. The Platinum Gym, located in Sosua, has two air-conditioned International Squash courts available by the hour. The facility shares space with a nice gym facility that features machines, free weights, and aerobics. Showers and locker space are available. Carib Wind Center in Cabarete will rent you windsurfers, kiteboards or Laser sailboats. They also have a larger Bahia sloop and Hobie Cat available with or without an instructor. The Center is world famous as a Laser training venue and each year, it hosts the Caribbean Laser Midwinter Championship with sailors from all over the world coming to compete in the spectacular waters off Cabarete Beach. Instruction is available for sailors, windsurfers and kite’s of all skill levels and one may arrange for a thrilling sail with the kids in Cabarete Bay. Two great 18-hole championship courses are located on the North Coast, and both are open to public play. Designed by Robert Trent Jones, SR., both Playa Grande and Playa Dorada are challenging oceanfront tracks which will test the skill of any golfer. At both courses, instructors are available, and both feature lovely restaurants and friendly pro shops. Mention Playa Encuentro in surfing circles and chances are good you’ll spark some real interest. Located between the North Coast seaside towns of Cabarete and Sosua, Encuentro features several fine breaks. Several surf schools and small restaurant/bars dot the shady area just behind the beach. Board rentals are available and classes are offered from skilled teachers. Encuentro is a scene, all by itself!